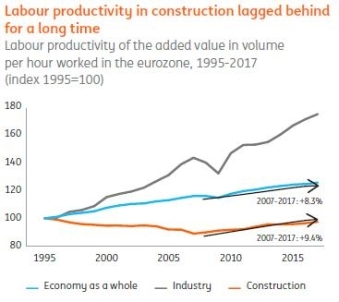 After a long period of stagnated growth in the construction sector, the digitisation of the industry is on the rise boosting efficiency, according to ING’s latest economics report ‘Construction sector digitisation but showing little industrialisation’. The report states that despite an increase in innovation in digitisation, industrialisation of the construction process in the eurozone is still lagging behind. For example, an employee in the sector has approximately €10,000 in machinery at their disposal – one fifth of the value available to employees in the manufacturing sector. Labour productivity in the construction sector has shown little signs of increase in the 21st century. However, since 2007, the average growth in labour productivity (2007-2017: + 9.4%) has aligned with the eurozone economy as a whole. This is a striking increase since production in the sector has decreased significantly over the past ten years. A reduction in volume usually results in diminishing productivity because it gives rise to overcapacity. As such, the productivity increase is also structural to some extent, due to innovation and more efficient construction methods. Construction companies have caught up significantly in terms of digitisation over the past decade. In 2016, an employee in construction had almost €1,000 in software at their disposal – a value that has doubled since 2000. Digitisation can provide many advantages in construction, where every project often has to be designed from scratch. It increases the efficiency of the design process and enables construction errors to be picked up early in the design phase. But many other activities in construction are being performed more quickly as the world goes digital. For instance, estimates for minor maintenance jobs can be provided solely on the basis of digital photos, saving a visit to a potential customer. Industrialisation has not been quick to take off in the construction sector. An employee in the sector has approximately €10,000 in machinery at their disposal – one fifth of the value available to employees in industry. This is because construction companies require a very high degree of flexibility. Robotics (a robotic bricklayer, for instance) and 3D printing combined with prefab could offer a solution, as this allows the mass customisation and flexibility required. However, high investment costs and building at a different location each time continue to pose bottlenecks.